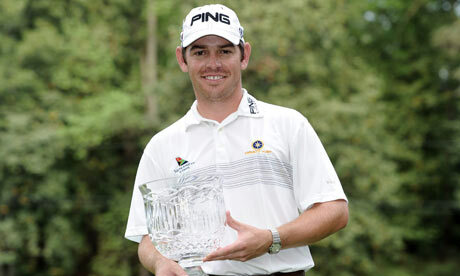 Louis Oosthuizen just won the 2010 British Open on Sunday. This was the first Major championship for the 27-year-old native of South Africa. Mr. Oosthuizen’s full birth name is a triple threat of tongue-twisting. Let’s try tackling his first name . . . umm . . . first. Here is the most important bit of advice I can give you in remembering how to spell certain words/names . . . try and break the word up into smaller, recognizable subwords, prefixes, suffixes, abbreviations and/or acronyms. So, let’s see if we can tear apart “Lodewicus”. Lodewicus is problematic because it doesn’t look like it would end with a “cious” sound. (LOU-dew-ic-ious) But let’s try and break it down just the same. It the contains the subword “lode“, but “wicus” doesn’t really subdivide well. However, what if we divided it into Lo/dew/ICUs. Then we’d have three subwords/acronyms we know and can easily relate to/remember. From there, you many want to try and put the words into some kind of sentence such as “The lo dew of the ICUs“. This is an example of a mnemonic device. Simliarly, we can apply the same principle to his middle name (Theodorus), with The/odor/us, as in “The Odor of us“. Now his last name, that’s a whole different kettle of fish. And speaking of fish, oost happens to be, amongst other things, the Dutch word for odor, while Huizen is Dutch for houses. So is Louis affiliated with the a fish house, or is he a fan of heretofore unrecorded Weird Al interpretation of The Animals hit (namely, “House of the Rising Smell”)? Sorry, I digress. Depending on who you ask, his last name could be pronounced WOOST-hay-zen, or OAST-hay-zen, which would at least give you a fighting chance of spelling it correctly. In future posts, I’ll provide links to foreign name pronunciation guides, along with other tips/hints on spelling those hard-to-spell athlete names. In the meantime, congrats to Mr. Fishhouse Mr. Oosthuizen.